Students from both Estacada High School and Summit Learning Charter graduated at higher rates than the state average during the 2017-18 school year. 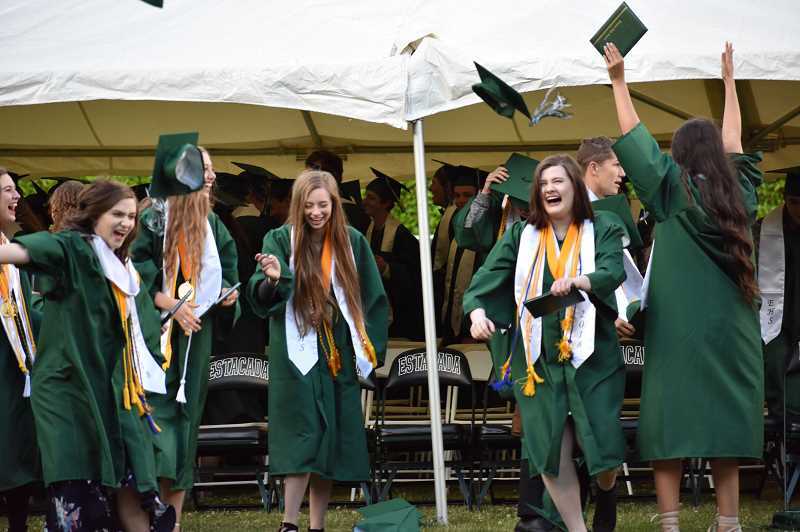 According to recent data from the Oregon Department of Education, Estacada High School had a graduation rate of 80.9 percent and Summit Learning Charter had a graduation rate of 94.4 percent. The state average was 78.7 percent. In total, the Estacada School District had a graduation rate of 61.8 percent. This figure also includes data from Summit Community College High School in Salem, a charter school sponsored by the Estacada School District that had a graduation rate of 19.3 percent. The program allows students to complete high school or receive a GED, a high-school equivalency diploma. In addition to its main location at Chemeketa Community College in Salem, the program offers additional options for GED programs in Woodburn. Graduation rates at Summit Learning Charter and Estacada High School are on the rise. During the 2016-17 school year, Estacada High School's graduation rate was 76 percent, up from 69.9 percent the previous school year. At Summit Learning Charter, the 2016-17 graduation rate was 83.2 percent, up from 71.4 the prior school year. "Our scores continue to incline. That's the biggest news," said Estacada High School Principal Bill Blevins. Summit Learning Charter Principal Sean Gallagher attributed his school's rising graduation rates to the student support team, implementation of intervention strategies and better data management. "We have a growing student support team of counselors and instructional assistants that are the heartbeat of the school," he said. Gallagher also credited the increase to parents and guardians, who support students as they work from home through the school's online programs. Summit also offers tutoring and extracurricular activities each week at their campus in Eagle Creek. "We want to continue to embrace connections of community between parents, learning coaches and the school," he said. Estacada High School leaders attribute the growth to a variety of factors, including collaborative work among teachers, after-school tutoring with transportation home provided, student success coaches and the services available at the Road to Success alternative school program. "We have a lot of caring teachers who open their doors every day to students who want extra help," Blevins said. Each Wednesday, teachers meet in groups to discuss student progress and identify ways to help them. "They talk about each kid, standard by standard," said Scott Sullivan, director of curriculum, instruction and assessment for the Estacada School District. Additionally, in 2016 the district launched the Road to Success alternative high school program, which allows students to receive a blend of small group instruction and individual online work as they make up credits. The high school also hired a success coach in 2018, who ensures that students are doing well in school and on track to graduate. When discussing areas in which the district would like to see improvement, Sullivan cited graduation rates for students with disabilities, who had a graduation rate of 37.5 for the 2017-18 school year, down from 55 percent the previous school year. "Our new inclusive practices are part of our attack to improve those scores," he said. Estacada High School leaders were happy to note that students who took at least one career technical education courses boasted a graduation rate of 86.6 percent. Sullivan and Blevins noted that the accomplishments found in the 2017-18 graduation rates are the result of group work across Estacada. "It's a K-12 effort," Sullivan said. "The elementary and middle schools help students prepare for their high school years." "It's a result of what parents and community members are doing to help kids succeed in school. It's a community effort," Blevins added.